Rising demand for gas guzzling SUVs puts Daimler, BMW and Audi in a bind. Bigger, faster cars are boosting profits but cancel out most of the progress on emissions control, new German data shows. Tightening European rules on pollution may see carmakers having to apply the brakes. 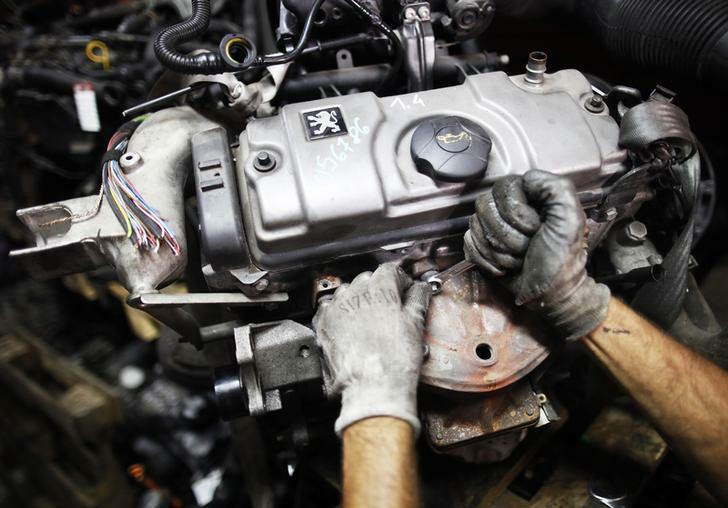 A worker tries to fix a Peugeot engine. The average engine of new cars sold in Europe’s largest car market had 137 horsepower in 2013, up from 123 horsepower in 2005, Germany’s statistical office reported on June 11. The increase led to additional annual fuel consumption of 3.8 billion litres in 2013, creating 9.5 million tons of additional carbon dioxide emissions, the agency estimates. Sports Utility Vehicles (SUVs) have been the fastest growing segment of Germany’s auto market for three years in a row. In 2014, sales rose by 20.6 percent while the overall market only grew by 2.9 percent, data from the Federal Motor Transport Authority shows.